I attend a lot of conferences, but mostly as a keynote speaker, workshop leader, or panelist. I don’t often get a chance to listen and learn. 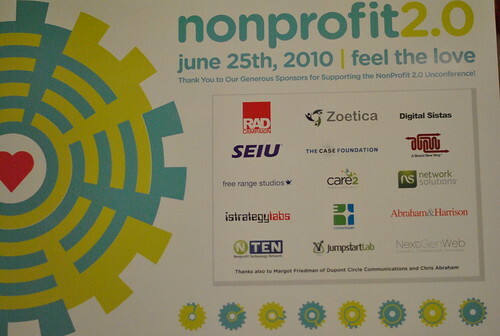 That was the gift of attending Nonprofit 2.0 Conference, especially the “unconference sessions” in Washington, DC on Friday. A big thank you conference organizers! We kicked off the conference with an interview style keynote about the Networked Nonprofit, moderated by fabulous Shireen Mitchell (aka digitalsista). The best part is when the audience joins the conversation. Shireen did a fabulous job of bringing in their voices. Many in the audience were colleagues that I have met through my blog over years and have helped me with Cambodian fundraising, like Roger Carr. 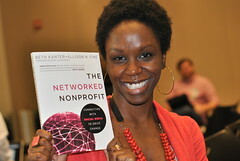 Rosetta Thurman, who writes about nonprofits and leadership issues from a Gen Y blogger perspective, shared some thoughts about the generations, nonprofits, and social media. Her blog is a must-read and I hope someday that she writes a book. Wendy Harman from the Red Cross was the next keynote. Wendy has let me shadow her work for the past five years and share her wisdom in many blog posts. She shared some insights about the Red Cross’s social media work leading up to Haiti. Robust listening program where staff skims and responds. Over 1,000 mentions a day. This gives the capacity to pay attention to what people are saying and be nimble in responding. They do not view social media as fundraising strategy. The objective is to empower to stakeholders to make their mission to be more efficient. They have a social media policy and handbook that provides the rule book for volunteers, staff, and affiliates to participate on social media channels effectively. Wendy has been working an internal social media capacity builder. She trains, coaches, and evangelizes internally on how to use social media. She has also been training staff in the disaster response department who in turn used tools like Twitter on the ground from Haiti. They had social content. It’s a mix of serious and fun content. When not in a disaster, you might see LOLcats doing CPR. A lot of practice on how to move quickly when a disaster strikes. For example, they immediately start updating their Facebook page letting people know what information is available and they are there. Don’t give up in the middle: Many nonprofits embrace social media with over-inflated expectations. They get midway through an experiment, view it as a failure and give up. 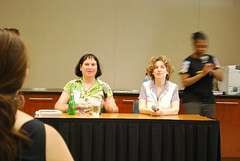 Everything looks like a failure in the middle as Rosabeth Moss Kanter likes to say. Don’t give up! Networks Ebb and Flow Like the Ocean: Networks have different stages of development and functioning. And they ebb and flow according to need. If you’ve built your network, like the Red Cross, they will be there for you. I participated in two unconference sessions. Here are my notes. I’ve Found My Free Agents, Now What? Here’s a couple of takeaways, but expect some more practical, how-to posts in the next few weeks. Look for Free Agents who already know about your work. Look to your in-house lists for potential free agents. They may already know about you and just need to be empowered. Care2 has a social media tracker tool that can analyze your list to see who is on social networks and how many friends. Scan Social Networks for Free Agents. I shared some of my special sauce about how I identify free agents as well as from my perspective of being one. There are Free Agents with huge networks like Shawn Admed, but don’t over look those that may have smaller networks – they’re just as valuable. Getting to Know and Cultivating Free Agents: Here’s my best advice on this. It comes down to do a little bit everyday and treating people like people. 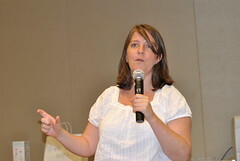 Wendy Harman was the inspiration for workshop curriculum on social media listening skills. So we offered to co-lead a session on listening in practice. Wendy is a real team player and made the session a lot of fun! We explored people’s listening routines, perceptions about the value of listening, and specific tools and techniques. 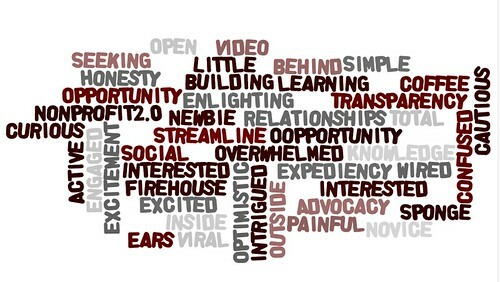 Actionable Listening: This is the first step that many nonprofits take for listening. When social media isn’t successful, it is because they skipped this. This is the type of listening akin to changing a flat tire on a moving car. It’s very practical and used to identify influencers, new ideas, and monitor brand. You can set up a comprehensive listening post or do “quick and dirty” simply set up one alert on your organization’s name. No matter the approach, it is useful to have a structured approach and track trends over time. Forensic Listening: Chris Abraham shared this method and is primarily for those who haven’t yet started. This approach, uses tools like SM2 to do a content scan during a particular past time period. Think of it as another channel of research for campaign. Showing Results: This method is for those have been applying listening techniques and want to track results. One metric that is used is “Share of Conversation” or how much people are talking about your brand. One method is to compare before/after a campaign to determine how much conversation social media strategy has been generated. Thank you Geoff, Allyson, and Shireen for organizing an inspiring conference! Wonderful write-up Beth. I will add it to our session notes. Thanks again for a terrific keynote conversation with Allison and Shireen and all the sharing you did during the sessions. What’s the url for the wiki? Love the write-up! I wasn’t able to attend this but thank you for sharing the insights you gathered. As always, your blog is a fantastic read! WHAT an awesome post, jammed-packed with useful, inspiring information! Thank you SO MUCH, Beth! Thank you for documenting this so very well Beth. You’re the best synthesizer I know, aside from New Order and Depeche Mode. Wow, Ditto Becky, Love that quote: Everything looks like a failure in the middle. You can set up a social mention alert for your CEO/ED, and your nonprofit, so that you can retweet or draw attention to the media attention you’re getting. You can also tweet each donation that you get, and why they gave. If they have a twitter account, so much the better! Thanks everyone! But I was really inspired to dig into practice! Excellent info for non-profs. Rosetta Thurman has great insight. Thanks for comprehensive post.